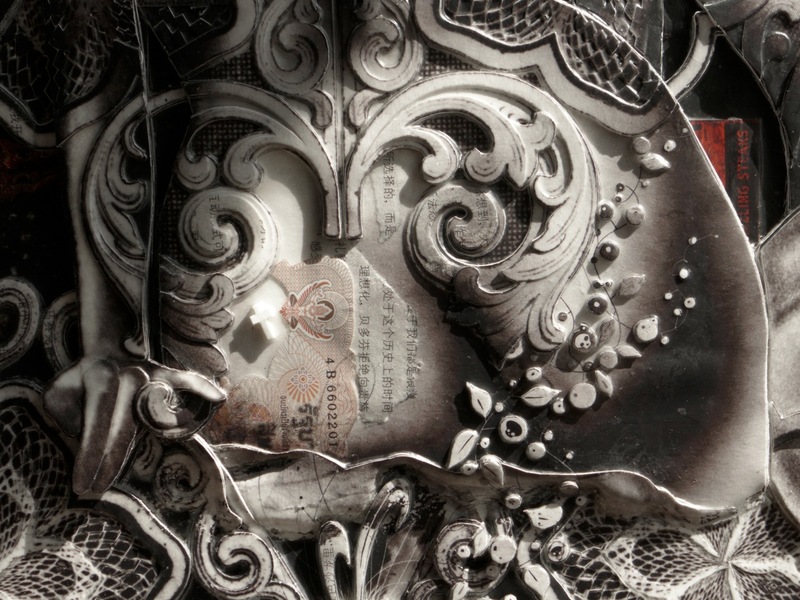 Handiedan: I am a female mixed media collage artist, age 34. Born and bread Dutchy and currently living and working in Amsterdam. I first started creating work full time as an artist in 2002 and began my current style in 2007. 1x: Let’s talk a bit about your process, how do you go about creating your pieces from start to finish? Handiedan: First, I digitally create the design, a computer collage and imagery manipulation. Bringing classic pin-up body parts together with ornamental components from currencies, sheet music and my own cartoon pen drawings. 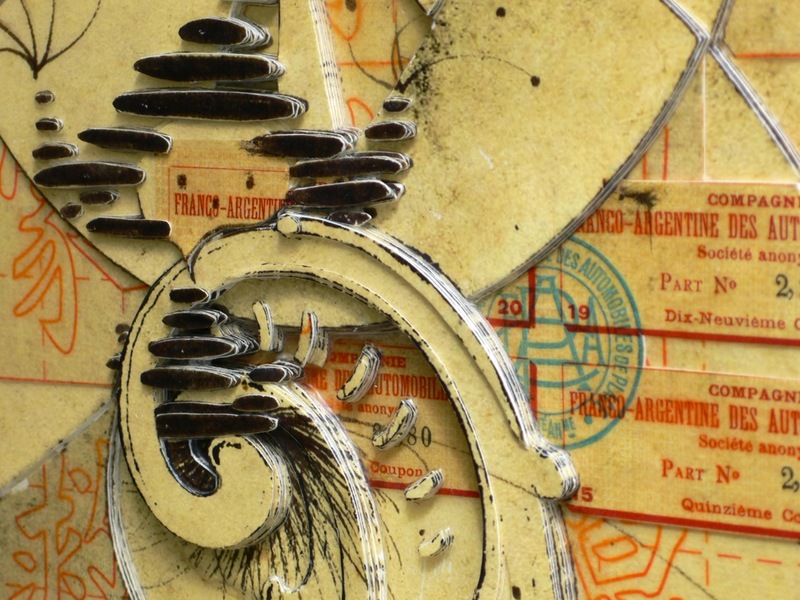 Then I rebuild these digital designs into multi-layered hand-cut collages with a distinctive three-dimensional quality. 1x: Do you start with sketching or studies to build a base or is it largely improvised? 1x:Where do you find your materials? Handiedan: I’m always collecting. By coincidence on there streets, or with a purpose on flea markets, or sometimes even fans send me material. 1x: Where did the influence for collage start to come into your work? Handiedan: In the beginning when social media started to rise, browsing creative images and artists became much easier. I really got inspired to start designing myself in this way. Collaging where the fine line between digital and analog faded. Fusing these two worlds always fascinated me. 1x: Discussing this latest body of work, what are some of the aspects that differentiate it from works past? Handiedan: For me personally the focus moved in the direction of quantum physics, cosmology, Western vs. Eastern philosophy and sacred geometries; Life/Energy and it’s continuously motion, in every shape and form, and the different ways of observing this. 1x: What are some of the similarities that continue from works past? 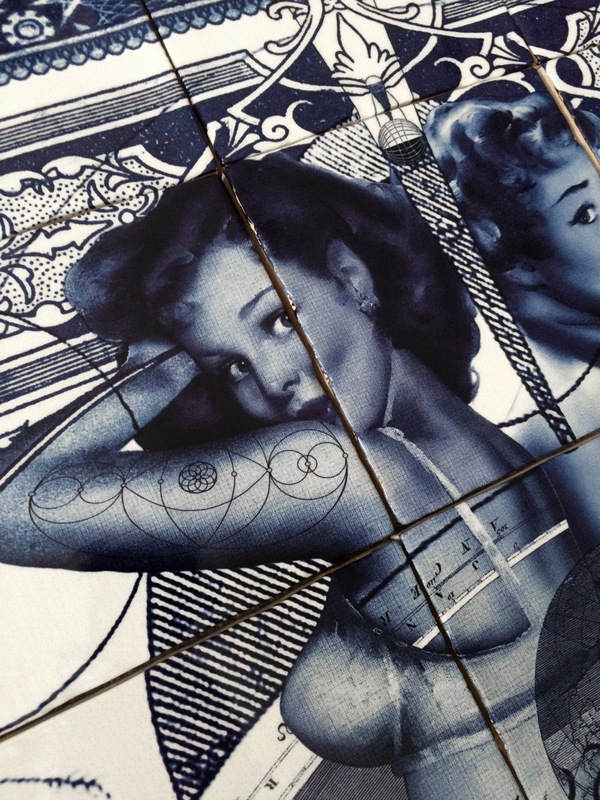 Handiedan: The esthetic form of the pin-up women, with their strength and sexiness as the main subject of my art. 1x: Is this most exhibition an entirely new body of work created solely for the show? 1x: Is there a theme to this latest body of work or is it more broad? 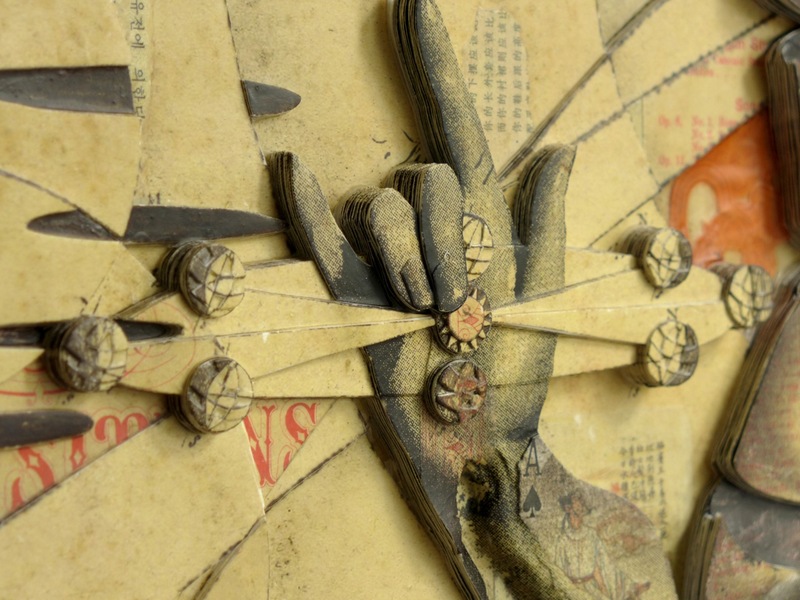 Handiedan: With this show I’ve tried to challenge myself in size and detail. The result is an overview of the type of artwork I’ve created throughout the years. But with the main subject as described earlier. 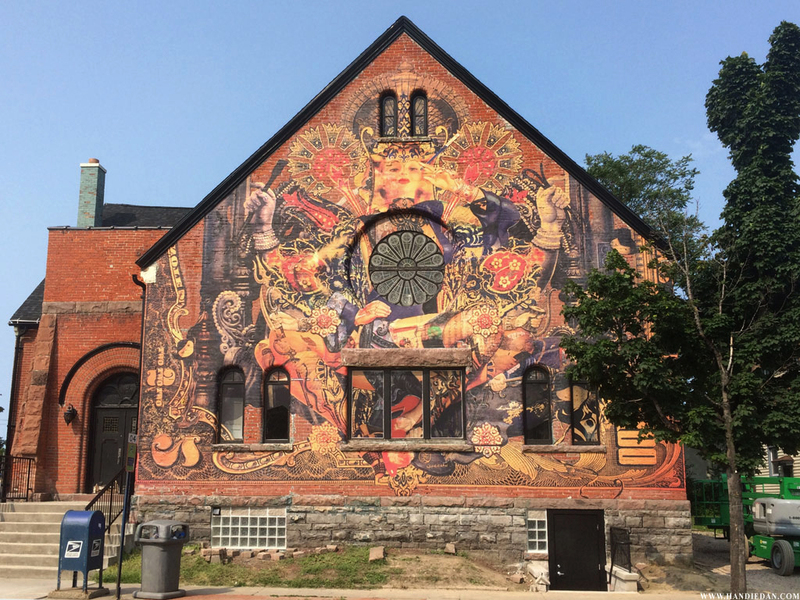 1x: I would also love to touch on some of your large scale works, how do murals/large public pieces fit in with your works and is that something you want to keep doing? 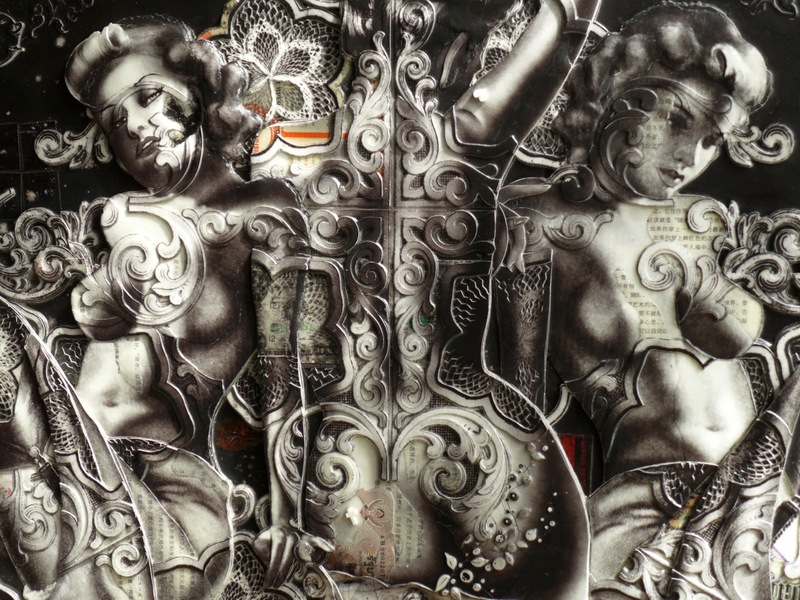 Handiedan: Bringing my pieces outdoors is not just an enlargement, but an extension of my art. It nourishes my investigation of the way tiny details and subjects are able to fuse within a larger design. At first sight, my work is very graphic, symmetrical, with a clear and centered main subject. But after a closer look, you find the busyness of the work with all its tiny details. It’s interesting to see how these tiny items become man-size and create a whole new interaction with the observer. Also, if you look at the mural projects and how I execute them: It’s not about just pasting paper on a wall. I want to integrate and fuse the image with the building. The building has to suit the image and vice versa. They correspond and become one. It’s like my original collages, Every piece has its corresponding frame. A fusion of artwork and frame. And of course, a very important reason is that art outdoors, reaches people who aren’t always in the position to go to a gallery, or where the priority or interest isn’t per se art. A new discussion, a new interaction with all different kind of people. 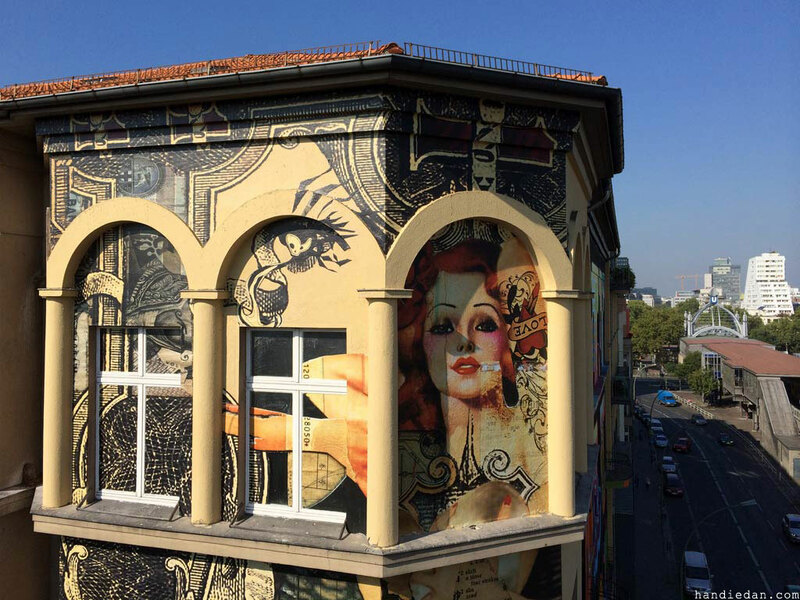 Handiedan was interviewed by 1xRUN Editor-In-Chief Pietro Truba. He has previously interviewed Ricky Powell for RUN #00881, Saber for RUN #00800 and Doze Green for RUN #00562. Follow him @Pietro1xRun.